Age eleven started playing the Banjo. Won 1st place in school talent show at age 12. First musical job at age 13. Father and son duo developed as a result of playing professionally and regularly. State fairs/ County fairs; Texas, Tennessee, Georgia, Alabama. Summer season two years in a row at Sea World, Aurora, Ohio. Disneyland California “Spring-fling” two years in a row. Camelback Inn Scottsdale, Az, Desert Inn Tucson, Az. Featured act with the Peter Duchen Orchestra Detroit, Professor Backwards, Boris Carloff Jr. The Red Garter saloon Chicago, Il. Disneyland stage show “Class of 27” Anaheim, Ca. Disney World “Class of 27 show”, The Banjo Kings, Pioneer Hall, Orlando, Fl. The New Christy Minstrels – traveling road show based in Los Angeles, Ca. Family nightclub in Mobile, Alabama known as“Pretty Boy Floyd’s” Dixieland Jazz club. Ruby Red’s Underground Atlanta, Ga.
Flash-in-the-pan Jazz Band founding member – Mobile, Al. World Famous Banjo Band Rosie O’Grady’s Orlando, Fl. Mickey Finn’s show – Las Vegas, NV. Steamboat Willie trio New Orleans, La. U.S. State Department “Thank You World Tour” on behalf of all the countries that gave to the Hurricane Katrina relief fund. Doreene Ketchen’s new Orleans Jazz all-stars booked through Wynton Marsallis’s Jazz at the Lincoln Center N.Y. City (Korea, Indonesia, Thailand, and Japan). Teamed with Doug Mattocks as the “Banjo Brothers” act Sacramento jazz festival Memorial weekend, four years running. Featured guest artist Sacramento jazz festival for nine years. Wrote and produced travel industry shows as part of a duel promotion for Eastern Airlines and Walt Disney World in South America. 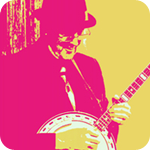 Only Banjoist to appear at all three Rosie O’Grady’s jazz clubs Orlando, Pensacola, and Las Vegas. “Steamboat Willie meets Plink Floyd” Volume 1. and 2.